Mersey, design number 4312, registered in 1884. Davenports became a limited company in the last years of operation. 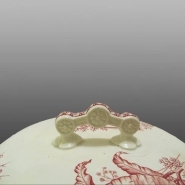 Chamber pot lid, earthenware with "Eldon" shape handle, transfer printed in burgundy with the named pattern Mersey, design number 4312, registered in 1884. Davenports became a limited company in the last years of operation.